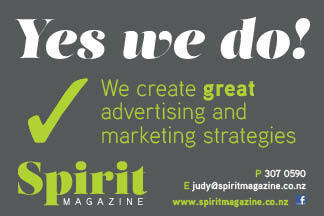 Spirit Magazine Ashburton Mid Canterbury is committed to respecting and protecting your privacy. To that end, we have prepared this privacy statement to disclose and describe my information gathering and dissemination practices for this website. We are committed to protecting your privacy. We do not collect personally identifiable information about you when you visit this site, unless you choose to give it to me by completing an online form or registering for my newsletter. If you do choose to give me your personal details (such as your name, email address, telephone number etc.) they will be able to be accessed by myself for the purposes for which you supplied it and/or so that we can better understand you and your interest in our magazine. While we do not collect personally identifiable information about you if you only visit my website, we do analyse non-identifiable web traffic data in order to help improve our website. This information does not identify you personally and is not linked to any personally identifiable information that you may have provided. For more information about our analysis of non-identifiable information please refer to the Google Analytics section below. We do not and will never disclose any personal information you provide to us to any outside parties without your permission, unless it is necessary to do so in order to carry out our service to you or otherwise as required by law. All information is aggregated by Google Analytics and provided to us to help us better understand usage of my website – no individual visitors are identified. Google Analytics is a leader in the Internet industry and their systems have been adopted as an accepted website traffic measurement standard amongst major Internet sites. You can learn more about Google Analytics by visiting the following links. If you would like to know more about how Spirit Magazine Ashburton collect, record, store and use any personally identifiable information you provide, please feel welcome to get in touch using the details below.